Gonzaga led Utah Valley 8-0 and the Zags’ 2017 mesmerizing season was off and running. They took their show on the road, winning the AdvoCare Invitational in Orlando, Florida, turning back No. 16 Arizona in Los Angeles and holding off Tennessee in Nashville, Tennessee. They thumped 17 straight WCC opponents by double digits. 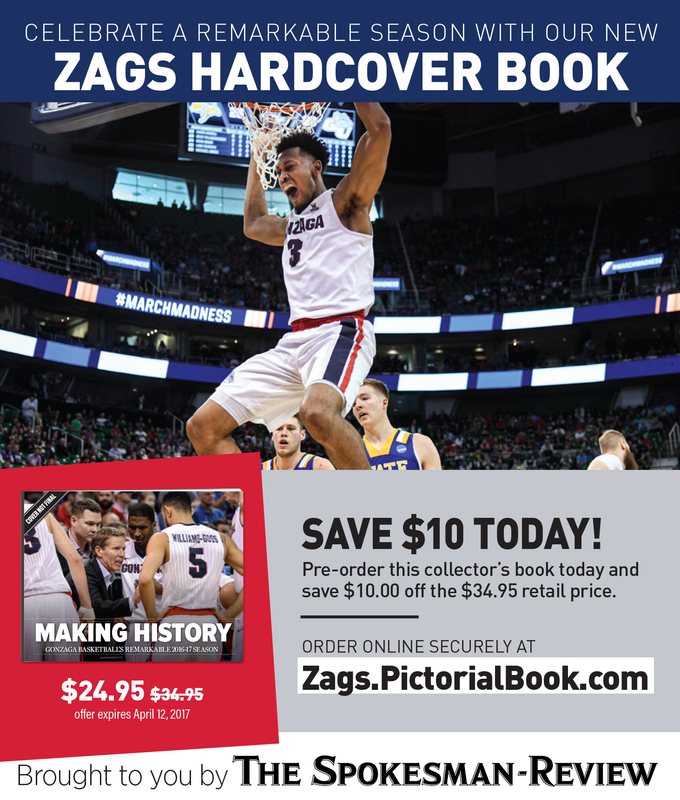 Could the Zags finish the regular season undefeated? Could they make the program’s first Final Four? Could they win it all? 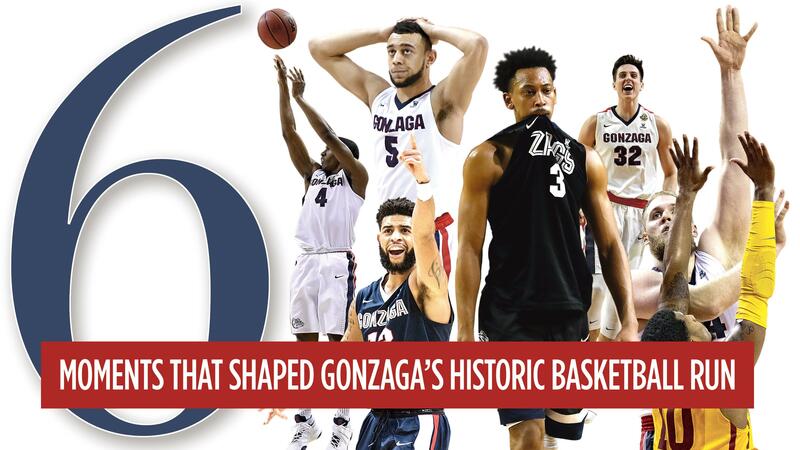 The answers can be found in the six key games and magical moments that shaped Gonzaga’s greatest season. Gonzaga’s 18-point lead in the AdvoCare title game had been whittled to three by No. 21 Iowa State when Zach Collins buried a 3-pointer with 5:36 remaining. That would be the Zags’ last field goal, but their defense kept denying ISU’s offense. The Zags needed one last defensive stand and they got it, forcing Monte Morris’ after-the-buzzer 3-pointer that was off line. The Zags beat nemesis Arizona in the Staples Center, relying on Przemek Karnowski’s 18 points and two late baskets by Williams-Goss. Gonzaga led by 16 early in the second half against a program that had won six of the previous seven series meetings. The Wildcats were within six when Williams-Goss drove on 7-footer Lauri Markkanen for a layup. Gonzaga’s lead was five with just more than a minute left when Williams-Goss made a clutch runner in the lane. “He’s ready to step up at any time,” guard Josh Perkins said of Williams-Goss, who scored 10 points while battling foul trouble. BYU ended Gonzaga’s run at regular-season perfection. The Zags led 18-2 in the first 5 minutes and were up 58-46 midway through the second half. The Cougars rallied behind Erik Mika (29 points) and TJ Haws (17). BYU scored the last 10 points. BYU celebrated its third consecutive win at the McCarthey Athletic Center. Gonzaga made just 16 of 29 free throws. Gonzaga and West Virginia were locked in a defensive struggle in the Sweet 16. Jevon Carter made a 3-pointer to give the Mountaineers a 58-55 lead with 1:40 remaining. The Zags scored the last six points, starting with two Williams-Goss free throws. Perkins swatted 6-9 forward Nathan Adrian’s layup attempt to give GU possession. Mathews hit one of the biggest shots in the program’s postseason history, a 3-pointer to put Gonzaga on top 60-58. Gonzaga’s defense was stout in the closing 90 seconds. Carter misfired twice on the Mountaineers’ final possession and the clock ran out before they could attempt a third 3-pointer. The Zags weren’t satisfied with just making the Final Four for the first time. They spent the first 29 minutes carving up South Carolina’s defense, building a 65-51 lead. It vanished in less than 4 minutes as the Gamecocks rattled off 16 unanswered points to take a 67-65 lead. Gonzaga got a break when Collins’ 3-pointer momentarily pinned against the backboard and rim before tricking through the net. “I’ve never seen a shot go in like that before, but I’m happy it did,” said Collins, who had 14 points, 13 rebounds and blocked six shots. Karnowski scored two baskets on feeds from Williams-Goss and Collins and Gonzaga was on top 72-67. Tillie’s rebound and two free throws sealed GU’s 37th victory. Gonzaga led the national championship game 65-63 with less than 2 minutes remaining after another clutch Williams-Goss basket. He scored the Zags’ last eight points. North Carolina, which opened the second half with an 8-0 run, captured its sixth national championship with a closing 8-0 spurt. Justin Jackson’s three-point play gave UNC the lead 66-65. Isaiah Hicks made it a three-point lead with a basket in the lane. Williams-Goss rolled his right ankle with 1:25 left, the same one he tweaked two days earlier against South Carolina, and his shot was rejected by Kennedy Meeks, leading to a Jackson’s clinching dunk with 12 seconds left. Published: April 8, 2017, 6:42 p.m. Updated: April 8, 2017, 10:21 p.m.